Redlands Bicycle Classic: Stage 2 - Powers, Amaran Cut Through the Redlands Beaumont Circuit Chaos - SoCalCycling.com - Southern California, Cycling, Cycling News, Amgen Tour of California, Bicycle Racing, Fun Rides, Cycling Event Schedules, Mountain Biking, Cyclocross, Cycling Photos, Cycling Videos, Interviews, Product Reviews. By the end of the day the first aid tent looked like a MASH unit. If this was your typical Cat 5 industrial park criterium it might be understandable, but this was the second stage of the 2013 Redlands Classic presented by the San Manuel Band of Mission Indians. 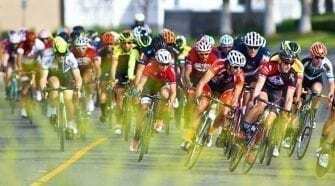 You would think a 24.1-mile circuit around the Inland Empire bedroom community of Beaumont would give professional bike riders sufficient elbow room. Even one of the lead motorcycles scraped pavement, sending a longtime Redlands volunteer to the ER. It was a long, dramatic day. And the plot was not confined to just close encounters of the asphalt kind. 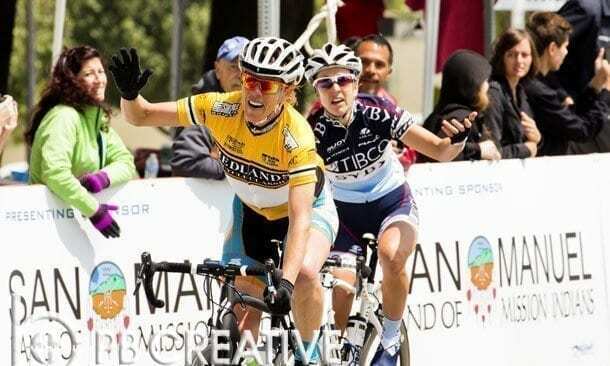 The three-lap, 72.3-mile Women’s race served up an exciting sprint finish that had overall leader Alison Powers (NOW and Novartis for MS) scoring her second straight stage victory. Or did she? Second place Joanne Kiesanowski (Team Tibco) was gesturing vociferously as she crossed the line in Powers’ wake, declaring that the yellow jersey had moved over and boxed her in against the right side barriers. Photographic evidence showed she had a case, but when the decision was made — which dragged on like “War and Peace” — the judges ruled that all’s fair and let the results stand. Completing the podium in this field sprint was a close Brianna Walle (Optum/Kelly Benefit Strategies). After three of five laps in the 120.5-mile Men’s event, it appeared that someone from a breakaway of 12 might just have a rare chance at victory. The gap was an eyebrow-raising two minutes, and Joey Rosskopf (Hincapie Sportswear Development) was the virtual leader on the road. But the general classification commander, Chad Haga (Optum p/b Kelly Benefit Strategies), had his squad driving like Spartans at the front and one lap later, with the bell ringing, the gap was closing rapidly. Somehow a six-man group was able to extricate itself from the hard-charging peloton, reduced by one when Ben Jacques-Maynes (Jamis Hagens Berman/Sutter Home) suddenly found himself prone on the roadway with a shoulder injury. 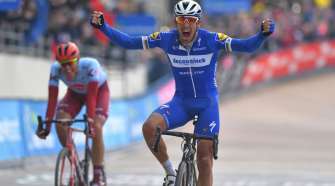 As the race rounded the final corner and pointed itself into a headwind up the slight Sixth Street rise to the finish line, the group was down to four. The main bunch was menacingly close. Having the best kick on this cool, partly cloudy day was Luis Amaran (Jamis Hagens Berman/Sutter Home), followed closely by Matt Cooke (Champion Systems/Stan’s NoTubes) and former Tour de France luminary Francesco Mancebo (5-Hour Energy/Kenda).